Fritz is shown here with Gibbers (left) and Bingo the Love Clown (right) during the Holiday Party in Verona, NY on December 12, 2010. Mike Faraino, drummer for Fritz's Polka Band leads a drum workshop at the Holiday Party on December 12th in Verona, NY. Matt Chase sang Christmas songs and played acoustic guitar at the Holiday Party in Verona, NY on December 12th. Santa Claus took time out of his busy schedule to stop by the Holiday Party in Verona, NY on December 12, 2010 and give out a bunch of gifts to the children. Throughout the Holiday Party in Verona, NY, people of all ages mingled with one another and enjoyed the various events, refreshments, and activities. Fritz's friend of many years, Matt Episcopo performed his family-oriented magic act during the Holiday Party in Verona, NY on December 12th. Oneida County Sheriff-Elect, Rob Maciol reads a Christmas story to some children at the Holiday Party on December 12th in Verona, NY. New York State Senator, Joe Griffo reads a Christmas story to some children at the Holiday Party in Verona, NY on December 12, 2010. Oneida County Executive, Tony Picente reads a Christmas story to some children at the Holiday Party in Verona, NY on December 12th. McGruff the Crime Dog stopped by the Holiday Party in Verona, NY on December 12th to greet people of all ages. Fritz is pictured here with his great friend, Joe Griffo (New York State Senator) during the Holiday Party that Fritz hosted for Town of Verona residents on December 12, 2010. Councilman Scherz presents a certificate of accomplishment and check for $325 to Elizabeth Peavey, winner of the Fred Scherz Sr. Memorial Scholarship for Volunteer Community Service, on June 16, 2010, as Fred Stefanik, Bob Pawlowski, and Barb Allen (committee members) look on. Fritz (near center, wearing white shirt) hosts a town hall-style meeting in Verona, NY on May 27, 2010. Fritz is pictured here with New York State Comptroller, Tom DiNapoli, during the Comptroller's Reception after the State of the State in Albany, NY on January 6, 2010. Comptroller DiNapoli congratulated Fritz for becoming Councilman on the Verona Town Board. 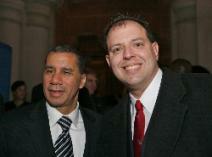 Fritz is pictured here with Governor David Paterson, shortly after the Governor's State of the State Address in Albany, NY on January 6, 2010. Fritz Scherz officially is sworn in as Councilman on the Verona Town Board, as Verona Town Justice, Randall Smith administers the oath of office and Fritz's wife, Kathy, holds the Bible, on January 4, 2010, in Verona, NY. Fritz Scherz is ceremonially sworn in by Assemblyman, Dave Townsend to become Councilman on the Verona Town Board. Looking on is Fritz's wife, Kathy, during a ceremony held before Fritz's immediate family on January 2, 2010. 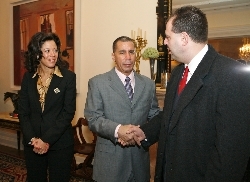 Fritz chats with Governor Paterson and First Lady Michelle Paige Paterson on January 1, 2010 at the Governor's Mansion in Albany, NY.